Utilities and PUCs are trying to solve grid issues and jump-start an industry. Despite the theoretical demand for grid-scale energy storage, in the real world, it has proven to be a difficult commodity to value. But whether it be by PUC mandate or by forward-thinking utilities, we've seen a small surge of energy storage solicitations that can be read as part of an attempt to figure out where energy storage fits into the grid and how to pay for it. These RFPs are a strong indicator of how and where utilities value energy storage. 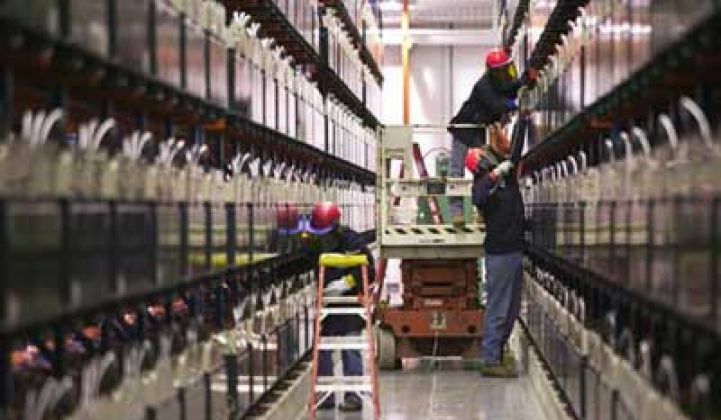 Last June, the PUC asked California's big three investor-owned utilities to procure 1.3 gigawatts of energy storage by 2020, along with setting market mechanisms to launch the procurement process. One of the mechanisms is managing smartly crafted utility RFPs and RFQs that search for qualified vendors, clearly define the problem at hand, and provide a fair and reasonable return for storage vendor and utility. Five recent North American energy storage offers are summarized below. KIUC just issued an RFP meant to provide solutions "to enable further solar penetration." Solar accounted for over 5 percent of Kauai’s annual electricity production in 2013, and that percentage is set to rise to 16 percent. According to the utility, "KIUC’s grid has a typical daytime electrical demand of 55 MWac to 65 MWac. With 21.1 MWac of solar PV in service, solar contributes as much as one-third of Kauai’s daytime demand during periods of clear sun." KIUC is currently using a combination of batteries and conventional generating units to mitigate the high variability caused by existing solar systems. Specifically, KIUC uses a baseload gas turbine (GE LM2500) in combination with four cycling marine diesels (Wartsila TM620) in droop control to respond to the majority of ramp events. KIUC also uses three 1.5 MW / 1.0 MWh battery systems to handle the most extreme ramp events. The batteries operate in frequency and voltage droop control and are not currently used to limit ramp rates coming out of the 6 MWac solar project. In other words, the full, unmitigated output of the 6 MWac solar project is fed directly into the KIUC grid, the gas turbine and diesels complement the ramp events, and the batteries only respond during the most severe ramp events. Each of these assets has its place -- the conventional units are slower to react than the batteries, but they can provide a much longer response. The batteries can perform the smoothing function quite well, but the more cycles they are called upon to provide, the less overall life they have. KIUC’s primary need is to be able to store over-generation during the midday hours in order to avoid curtailment of low-cost renewable energy. KIUC’s secondary need is to be able to dispatch stored energy to assist conventional units in meeting the significant ramp event that will occur each afternoon as the system load heads toward the daily evening peak, i.e., an over 40 MW increase in approximately 4 hours. Yet another need is to be able to shave the evening peak, which is currently the highest cost period to generate power. KIUC "understands that the cost of energy storage systems can be greatly reduced by incentives that are tied to renewable energy projects, and will therefore consider projects that offer dispatchable renewable energy (i.e., solar plus energy storage) under a PPA arrangement." 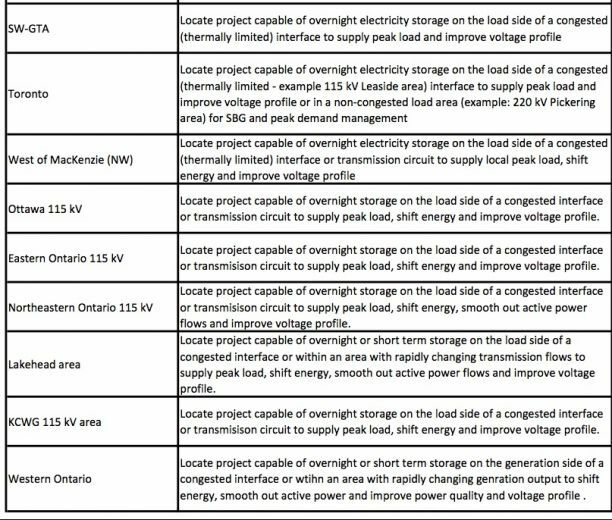 Ontario's proposed energy storage procurement framework specifies that 50 megawatts of energy storage will be included in procurement processes by the end of 2014 and stresses the learning process involved in this new technology. "The OPA and IESO will work closely together throughout the procurement phases to maximize learning about energy storage services in the Ontario context," according to the RFP. The initial phase of procurements will focus on reliability services. The Ontario solicitation, like the SCE offer, homes in on specific substations or circuits that are congested or "within areas with rapidly changing transmission flows." The 50-megawatt Southern California Edison Los Angeles Basin Energy Storage RFQ reveals a California utility industry getting its head around deploying big energy storage. The SCE solicitation was notable for the effort taken to identify the true value of grid-scale energy storage. In the words of John Zahurancik, VP of Deployment and Operations at AES Energy Storage, "The Edison RFQ is the first formal recognition by a state that [energy storage] absolutely has value." Praveen Kathpal, AES Energy Storage's VP of market and regulatory affairs, said that the RFQ is oriented toward local capacity requirements in the Los Angeles Basin -- a capacity alternative offering in which "energy storage can perform the same functions as building a new peaking power plant." Zahurancik observed that California and SCE have structured the offer so that storage can be treated similarly to a preferred resource like demand response or energy efficiency. But "energy storage is new for all of us," said Rosalie Roth, Sr. Contract Originator and Energy Storage Product Lead at SCE, during a webinar to support the solicitation. As to what type of technology SCE is looking for, Roth said, "Show us what you've got." She noted, "This RFQ is complex -- it's going to be a challenging solicitation." She said that all qualified resources are encouraged to participate and communicate, adding, "We are figuring it out along the way." Imperial Irrigation District (IID), a municipal utility that provides power and water services to about 150,000 residential, commercial, and industrial customers in the southeastern part of California's desert, just took a step toward deploying energy storage with the issuance of QR 123, the start of a solicitation for what will eventually be 20 megawatts to 40 megawatts of battery storage. The utility wants "respondents to design, engineer, procure and construct a utility-scale energy storage project," and the solicitation specifies that it is a "battery" storage project. That implies that flywheels, portable CAES and rail cars need not apply. At this stage, the utility is simply looking at vendor qualifications and getting input from companies including A123 Systems, Black & Veatch Renewables, Borrego Solar Systems, Clairvoyant Energy, Coachella Energy Storage Partners, EnerVault, Prudent Energy, S&C Electric, Stem and Tenaska Solar Ventures. According to the solicitation, respondents should have experience in "generation projects, transmission grids, balancing authority area, and interconnected power systems" and an understanding of "power flow, voltage profile, line flow, transmission flow, transmission losses, generation patterns, renewable intermittency, regulation criteria, operating reserves criteria, NERC and Federal Energy Regulatory Commission (FERC) reliability requirements." New York City utility Con Edison has submitted a proposal to furnish 100 megawatts of load reduction measures that include energy storage, demand response and energy efficiency. The new incentives for energy systems that provide summer on-peak demand reduction are $2,600 per kilowatt for thermal storage and $2,100 per kilowatt for battery storage systems, with bonus incentives for projects larger than 500 kilowatts. Incentives will be capped at 50 percent of the project cost. The proposed New York City incentive bears some resemblance to California's Self-Generation Incentive Program, a subsidy established by California's PUC to support existing and emerging distributed energy resources, which provides one-time, upfront rebates for distributed energy systems installed on the customer's side of the utility meter. In California, qualifying technologies include wind turbines, fuel cells, and associated energy storage systems. GTM Research’s recent report, Grid-Scale Energy Storage in North America 2013: Applications, Technologies and Suppliers, pinpoints the most promising energy storage applications, geographic markets and market segments and profiles over 150 companies active in the North American storage industry, including 25 that are particularly well positioned to succeed. More details are available here.